Spring bulbs are available in garden centres from the end of March until the end of April. They might not look like much when you buy them, but those little bulbs will reward you with a dazzling display of flowers come spring. Top tip: Plant out as soon as possible after purchase. Bulbs that do best in full sun include babiana, Ixia, Ornithogalum, sparaxis, tritonia and ranunculus. Allium, hyacinth, freesia, and leucojum (snowflakes) need a shady spot, but can take a few hours of sun early in the morning or afternoon. Bulbs that like the sun but require protection from the hot midday sun include hyacinths, anemones, tulips, narcissus, daffodils, Ixia, muscari, Lachenalia and Dutch iris. An east-facing bed which receives morning sun and afternoon shade is ideal for most bulbs in the summer rainfall and dry continental regions, as September can be a very hot month in these areas. Give some thought to how you’d like your garden to look once the bulbs start to flower. Spring bulbs create a lovely effect in the borders of garden beds, while those with striking foliage look particularly good in containers. Formal plantings: Ribbon planting in solid blocks of colour can be very effective, particularly in large gardens, or alongside paths or driveways. Informal plantings: For a more natural look, plant bulbs in drifts and clumps. In a rock garden: The bulbs of indigenous plants are the most suitable for a rockery as they will grow under warmer conditions than some of their European relations. Examples are freesia, sparaxis, Ixia and tritonia. However, they must have cool roots, so plant them well tucked in-between rocks. In containers: When planted in containers, bulbs add an instant splash of colour and impact where needed. Place a layer of broken pots, stone or bark chips at the bottom of the pot for drainage and to prevent loss of soil out of the drainage holes. A good soil mixture for bulbs consists of two parts medium-grained river sand, one part loam and one part fine compost. Never allow the soil to become dry – watering every day may be necessary. Prepare your beds or containers at least a week before planting to allow fertilisers time to dissolve, otherwise they may burn the bulbs. 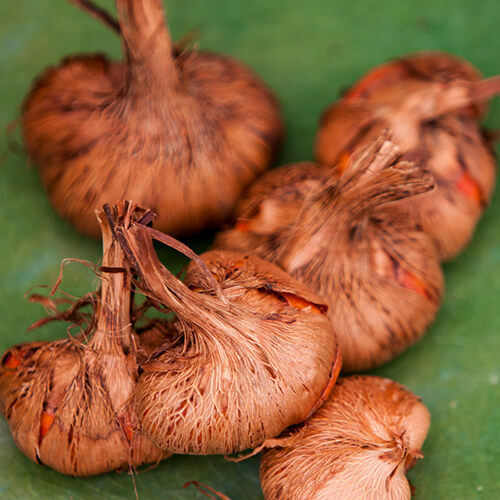 Before planting, dig the soil over to about the depth of a spade and add a generous amount of compost – bulbs do best in cool, well-drained soil. Dig in a handful of planting fertiliser or bonemeal per square metre to a depth of 30cm and water well. Avoid using fresh manure as this may burn the bulbs. For pots, add water-retaining granules to help the soil retain water during dry months. Don’t have optimal soil? Very sandy soil can be improved by digging in organic matter such as compost as well as water retaining polymers. Clay soil will benefit from the addition of some coarse sand and lots of organic matter such as compost to improve drainage and texture. Every bulb has its unique requirements for how deep it should be planted, and how it should be spaced, so read the planting instructions carefully. As a general rule, bulbs need to be planted at a depth of three times their height. If you are planting amongst established plants, dig the hole a little deeper than required. Water is the single most important factor in ensuring success from your bulbs. The roots need to be kept continuously moist from planting time onwards. The ideal watering is done with a sprinkler, for approximately 45 minutes every 4-5 days. Monitor bulbs planted in pots carefully, as their moisture will dry out quickly and may need topping up every day or two. Feed with a handful of 2:3:2 fertiliser per m² about two weeks after planting to encourage growth. Once the first shoots start appearing, feed with bulb food once every two weeks with 3:1:5 Vita Flower or Hadeco 2:1:1 Bulb Food. Early spring (end of July into August): Daffodils such as ‘Paperwhite’ (very early), ‘Flower Carpet’, ‘Fortune’, ‘Ice Follies’, ‘Juanita’, ‘Trevithian’ and ‘Winter Gold’, ranunculus, Dutch iris, anemone, freesias, leucojum and hyacinth. Mid spring (August): Daffodils such as ‘Barrett Browning’, ‘Birma’, ‘Early Splendour’, ‘Margaret Mitchell’, ‘Monique’ and ‘Orange Bell’, ranunculus, ipheion, muscari, Dutch iris, anemone, freesias, leucojum and hyacinth. Late spring (end of August to mid-September): Daffodils such as ‘Acropolis’, ‘Buttercup’, ‘Cheerfulness’, ‘Home Fires’, ‘Mount Hood’, ‘Pink Select’, ‘Tahiti’, ‘Thalia’, ‘Salome’ (very late) and ‘Minnow’ (very late), Ixia, sparaxis, ranunculus, tritonia, ipheion, muscari, tulips, anemone, freesias, leucojum and hyacinth.